A newly formed environmental coalition has a bone to pick with the rail industry. 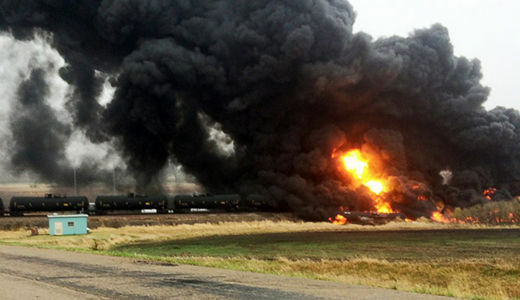 On May 6, in the North Dakota town of Heimdal, another train carrying oil derailed and exploded, setting 10 tanker cars on fire and sending flames hurtling toward the sky. The U.S. Department of Transportation (DOT) stepped in with new regulations, imposing a 40 mile-per-hour speed limit on trains transporting crude through big cities. Environmental groups have largely seen it as a flawed and unhelpful measure, and on May 14 they filed a lawsuit against the department over inadequate regulations of trains that pose a threat to communities across the country. That lawsuit was submitted to the 9th Circuit by Earthjustice, on behalf of seven organizations – the Sierra Club, ForestEthics, Waterkeeper Alliance, the Center for Biological Diversity, Washington Environmental Council, Friends of the Columbia Gorge, and Spokane Riverkeeper. All of them feel that the DOT’s supposed safety standards are virtually nonexistent, in light of the many periodical oil train disasters that preceded the May 6 incident. The importance of rail safety, moreover, has careened into the national spotlight after an Amtrak derailment in Philadelphia on May 12, which killed seven people and left at least 200 injured. That last bit is particularly important; while the Heimdal explosion did not cause any injuries or fatalities, prior incidents, like the infamous Lac-Mégantic explosion in Quebec, which killed 47 people, were much more devastating. The group listed numerous flaws and problems that need to be addressed with how the DOT handles oil trains, including allowing outdated tankers to keep carrying crude for 10 more years; allowing trains to move at much faster speeds in areas that are not considered major cities, such as rural areas with sensitive wildlife or even small towns; failing to impose the 40 mile-per-hour rule on trains hauling less than 35 tanker cars (a huge loophole in the new rule); allowing the industry to merely “retrofit” old tankers instead of replacing them; and allowing the rail industry to add 7,000 new tankers to U.S. railways next year, without bothering to remove the current outdated ones from rotation. One of the coalition’s criticisms was the rail industry’s penchant for maintaining the constant usage of older tanker cars, when those models are problematic and long past their expiration dates. But as the North Dakota disaster has shown, even a full upgrade to modern cars cannot change the fact that oil-by-rail transport is a deadly activity. Amy McBeth, spokesperson for BNSF railway, inadverdantly gave voice to this harsh truth, when she confirmed that the train that derailed in Heimdal consisted of the newer tanker cars. “The cars involved in the incident are the CPC-1232 models,” she remarked.